Happily Ever After Thoughts: LOGAN'S LUCK (Last Chance #4) by Lexi Post Released! 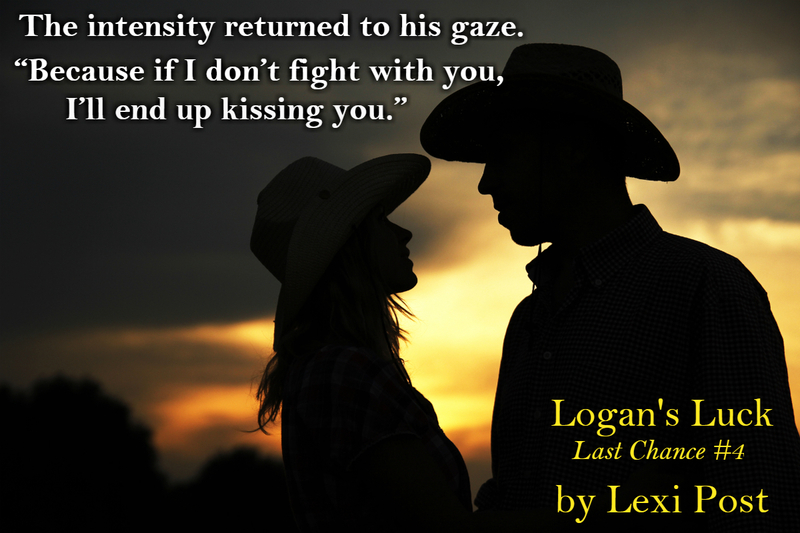 LOGAN'S LUCK (Last Chance #4) by Lexi Post Released! Logan Williams has plenty of luck. The problem is, it's all bad. Logan is not happy his cousin retained the services of Dr. Jenna for the Last Chance Ranch. She may be the local vet, but he’d hoped never to see her again because it had taken so long to forget her the first time. Jenna Atkins is not afraid of Logan’s bark because any man who looks at his baby daughter the way he does, has got to have a good heart buried somewhere in there. That doesn’t mean she plans to get any closer than they already were. But when baby Charlotte’s mother arrives and sets her sights on Logan, Jenna discovers a territorial side of herself she didn’t know she had. The question is, should she walk away and let Logan’s luck run its course or should she interfere? Knowing Logan, either way, she’s bound to get hurt. Once outside and around the corner of the barn, Jenna stopped. “What are you doing?” Her words were clearly ground out between clenched teeth. Lexi Post is a New York Times and USA Today best-selling author of romance inspired by the classics. She spent years in higher education taking and teaching courses about the classical literature she loved. From Edgar Allan Poe's short story “The Masque of the Red Death” to Tolstoy’s War and Peace, she's read, studied, and taught wonderful classics.